Salmon, Tuna and Swordfish are part of the sashimi selections. They are sliced way too thin and you actually have to stack three pieces together to get a decent bite size. Though it is fresh, it just doesn't have the shiokness. Sushi Counter. They are definitely eye-catching. The best part of the sushi is the cuts of the proteins are very generous on top of a small portion of rice. The fish, unagi or even beef can cover all sushi rice when you put it all in your mouth. Their salmon aburi and unagi sushi are the must- try here. Cooked Food. The cooked food are served on rotation basis. When a dish is finished, it will be replaced with a different dish. Not to be miss is their signature Chilli Crab with Fried Bun which are feature permanently. Using the Indonesian mud crab, the meat of the crab silky and sweet. The gravy is spicy and tangy, good for dipping with the fried bun. The stewed pork belly and scallops with broccoli definitely got my approval for the night. Roast Section. Promoted as the signature dish of this restaurant, the roast section certainly did not live up to its reputation that evening. The roast beef is on the dry side and did not give me the WOW. The same can be said about the sausage. The best dish at the roast station is actually their mash potatoes, which was smooth and creamy, it passed my QC test. Tempura. The prawn tempura is good, if you can get your hands on it. Sea and Blue uses a good size of prawns. You need to keep an eye on this station because once the Chef finished frying the prawn tempura, it will be gone in seconds and you will be left with only vegetables tempura. Salad, fruits and Cold Cuts. The selections are extensive. More than a dozen different type of salad ingredients, with fruits and cold cuts. Definitely, you can find something to meet your vegetable needs for the night. Korean Section. The must-try section in the Sea and Blue. They have a DIY bibimbap station, Korean Bbq, cooked food sections and cold dishes as well. I highly recommend is the Korean Cold Noodle that goes well with the Bbq beef ribs and Bbq pork belly. I did not manage to try the tteok-bokki and bibimbap, however I did manage to try their pancake and their fishcake. It is tasty and you can actually have it without the dipping sauce. Pizza and Pasta. We are choosing between the lesser of the two carbos as we were almost full. At the end we picked the pasta as they are cooked ala minute. We ordered the penne alfredo and plain spaghetti in white sauce. Surprisingly, the plain looking spaghetti is packed with punch. It is creamy, cheesy with a solid OMPH. 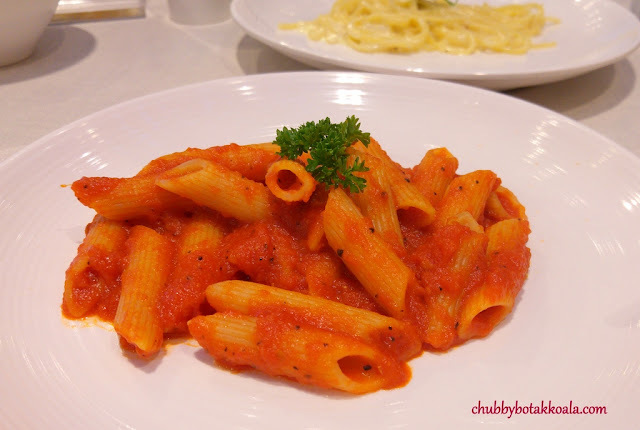 The penne is generously coated with the tangy tomato sauce that will open up your appetite. It can do with a more generous sprinkle of cheese. Desserts. They have tarts, macarons, donuts, different pastries and shots, Bingsu station and Chocolate fountain. I tried their tiramisu, pumpkin pie and chocolate moose, it was pretty ordinary. However, the one that catch my eyes are the jumbo size strawberries at the chocolate fountain. Had a few of this and it was a nice ending to the meal. Drinks Station. The buffet comes with free flow of soft drinks, coffee and tea. Alcoholic beverages are available at extra cost. 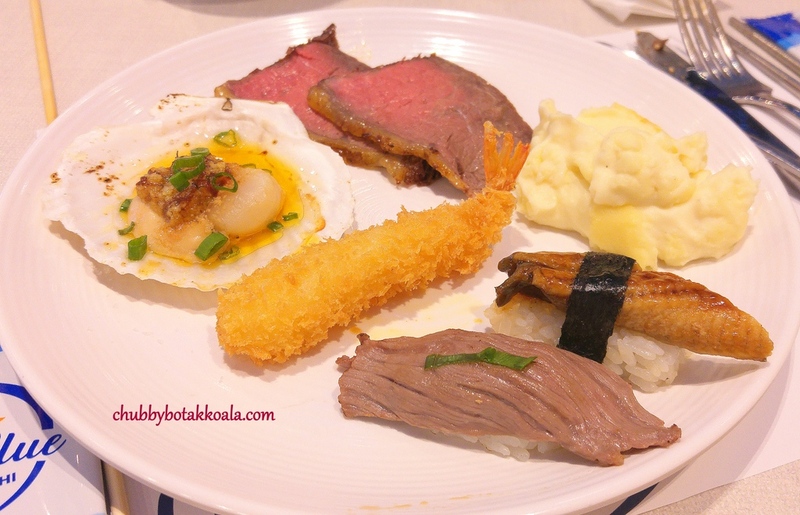 Overall, Sea & Blue is definitely a buffet place that you want to try. 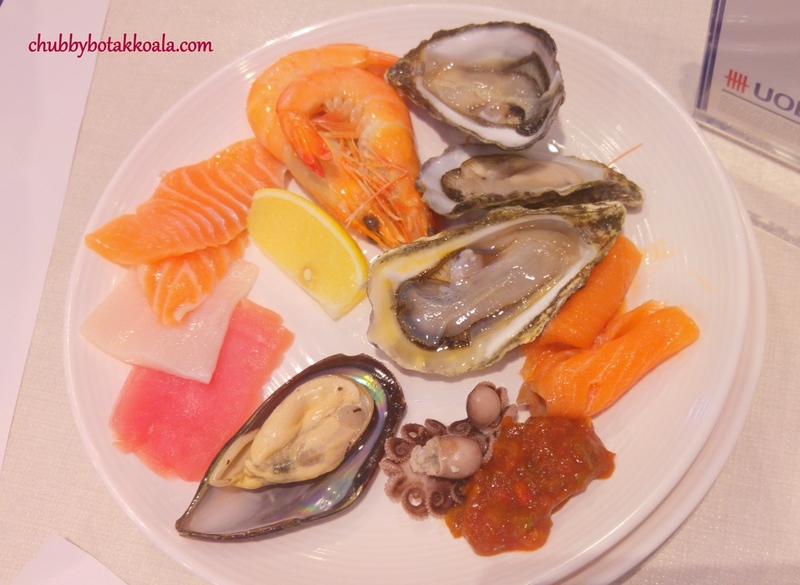 The spread is just extensive and I am sure you will not be able to try them all. 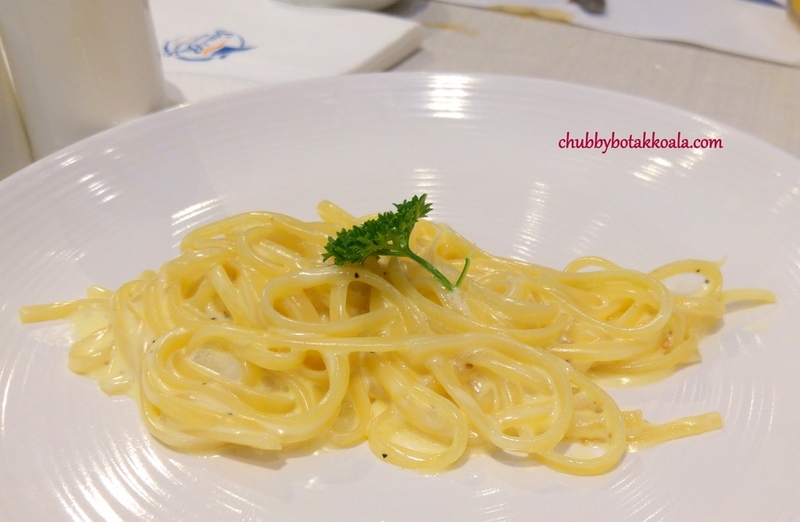 I personally like their Korean Station, Cold Seafood, Cooked Food sections and their pasta. The price is very reasonable. So check it out if you are in Marina Bay Sands. Cheers!! Thank you very much to HungryGoWhere and Sea and Blue Team for the tasting invitation.